A gothic tale of kidnapping, murder, cannibalism, and mayhem in the insect kingdom, Ten Little Ladybugs, written by Melanie Gerth and illustrated by Laura Huliska-Beith, presents a troubling view of the devastating havoc that eschatological idolatry and ideology wreak on America's children. That such potentially scarring material is promoted as a "children's book" is even more troubling. The cover is gaily festooned with the pastoral scene from a bourgeois garden, the smiles on the faces of the predatory insects arrayed around the ladybugs designed to mislead even the most cynical reader. The ladybugs themselves are given special treatment, being plastic appliques which can be touched by the unwitting child-victim. This pre-literate tactile contact enhances the bond between the reader and the helpless meals-ready-to-eat. As the pages are turned, and the ladybugs are devoured one by one, the appliques disappear one at a time as well, leaving only holes in the book (and in the soul and heart of the toddler holding it). Ten little ladybugs, sitting on a vine. and when the reader turns the page, of course, they will find the word "nine," and the first of the harmless ladybugs has been consumed by the innocently smiling butterfly. The phrasing of the poem, an homage to Agatha Christie's classic suspense thriller Ten Little Indians, is both calculated and cruel. As in that grim, humourless work, there is no detective come to save the day here; no Pea weevil Poirot to stop the slaughter and accuse the guilty. All there is here is death, senseless and brutal. 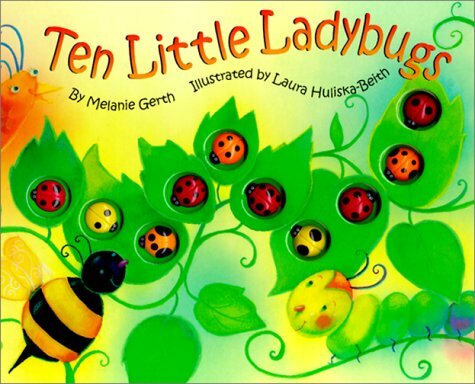 The innocence of the ladybugs is maintained throughout the narrative. It is more than mere unwariness -- even as they move towards their stomach-acid drenched doom, the author relentlessly describes them as "skipping," "dancing," trying to force the reader into accepting the (nonsensical) idea that the ladybugs have accepted, even welcomed joyously, being rent asunder in this fashion. The analogy to Leni Riefenstahl's Tag der Freiheit, which likewise disguised the horrors of the Nazi regime by focusing on the smiling, fresh faces of German soldiers, could not be more clear. Of course the caterpilllar is healthy and strong -- he is nourished by the flesh of those he oppresses. I will not excerpt the entire book here -- enough harm has been done by Gerth and Huliska-Beith, and I do not want to continue the madness -- but their message is corrupt and corrupting: "No one is innocent." A bee, a turtle, a duck, even animals that are not insectivorous take part in the macabre ladybug buffet. Along came a breeze, and then she was...home. The symbology here is powerful and insidious. By employing the very elements themseves to deliver the coup de grace, Gerth disclaims responsibility and absolves the guilty of their crimes. "That's the way the world really works," she seems to be saying. "Get used to it, kids. Eat or be eaten." Such a message, while dispiriting, might be acceptable in a book targeted at an older audience (Orwell's "a boot stomping on a human face...forever" comes to mind), since it could be viewed as a cautionary tale. Here, targeted at toddlers, it is merely mean-spirited. In the final page, depicting all the ladybugs "safe and sound" in the afterlife, happily cavorting with their various tormentors, you can hear the authors' cruel, mocking laughter echoing through the page. It chilled me to the very bone. Next week: The feast of Atreus and Miss Spider's Tea Party. *chuckles* You are brilliantly macabre. Thanks for the alternate view on this classic bit of children's literature. It is perhaps sad to admit that I own this book and don't have children. This review has the quality entertainment I've found in a review of another guilty pleasure of mine, Kid Cuisine TV dinners. This is absolutely ridiculous..... do you not have anything better to do than sit around and think of bad things to say about children's books? Get a life. This was my daughter's favorite book. Kid's just don't think like that. All I can do is roll my eyes at people like you that come up with these ridiculous comments. "Was" her favorite book. Now she's DEAD! Thanks to YOU! YOU ARE THE MOST IGNORANT PERSON I HAVE EVER HEARD!!! THIS IS A CHILDREN'S BOOK! WHAT KIND OF PERSON HAS NOTHING BETTER TO DO THAN MAKE UP A COMPLETE DISTORTION OF WHAT IS A COMPLETLEY INNOCENT BOOK. GET A LIFE!!!!!!!!!!!!!!!!!!!! !